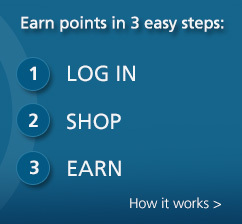 Learn more about Points for Shopping and other benefits from Amtrak Guest Rewards. Founded in 1888, the National Geographic Society is one of the world's largest nonprofit scientific and educational organizations. Our mission is to increase and diffuse geographic knowledge while promoting the conservation of the world's cultural, historical and natural resources. At the National Geographic store you can purchase unique gifts inspired by the world! No rewards given on: Genographic Participation Kits, Platinum Atlases, handling charges, and gift cards/certificates. Rewards will not be given on sales made to those customers who received a National Geographic gift catalog.